The Union Minister for Water Resources, River Development and Ganga Rejuvenation Nitin Gadkari inaugurated the workshop on River Ganga in New Delhi. 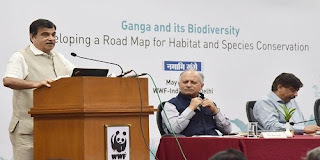 The theme of the workshop was ‘Ganga and its biodiversity: Developing a road map for habitat and Species conservation’. The workshop was organized by the WWF (World Wildlife Fund). A report on ‘Status of conservation of select aquatic species’ was also released during the workshop. He also was a database of Ganga Praharis, a self-motivated cadre that is being created by Wildlife Institute of India (WII). Ganga Paharis are a self motivated volunteer cadre from local communities who have been trained and taken onboard by National Mission for Clean Ganga (NMCG) and WWF to make Clean Ganga Mission a mass movement. A clean Ganga will not only be helpful for the environment but will also boost our economy. Nitin Gadkari emphasized the need to approach the challenges of cleaning river Ganga through an integrated approach and with synergy between development and ecology. Activities like plantation on the river bank, boating, construction of Mukti Dhams and Ghats will be increased. This will increase employment opportunities and will mobilize public participation of the local residents in the task of cleaning Ganga.